As promised, we’d like to share a new “Stories from Inside” entry with you this week to kick off our blog’s return to activity. The author of this entry just completed our ADHD coaching curriculum in January of 2015. We found his revelations insightful and inspiring, and hope you do, as well. 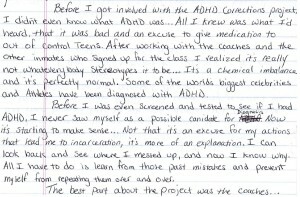 Before I got involved with the ADHD Corrections Project, I didn’t even know what ADHD was…All I knew was what I’d heard, that it was bad and an excuse to give medication to out of control teens. After working with the coaches and the other inmates who signed up for the class I realized it’s really not what everybody stereotypes it to be…It’s a chemical imbalance and it’s perfectly normal. Some of the world’s biggest celebrities and athletes have been diagnosed with ADHD. Before I was even screened and tested to see if I had ADHD, I never saw myself as a possible candidate for diagnosis. Now it’s starting to make sense…Not that it’s an excuse for my actions that lead me to incarceration, it’s more of an explanation. I can look back and see where I messed up, and now I know why. All I have to do is learn from those past mistakes and prevent myself from repeating them over and over. The best part about the project was the coaches…having a class full of inmates ages 18-46, who have all screened positive for ADHD can get a little crazy. They never complained, never turned one of us away or made us feel less than human because we were incarcerated. They gave us tools to cope with ADHD, and community resources we can use once we are released. They never gave up on us, and that means a lot. I am grateful I got to participate in the ADHD Project and would recommend it for anybody struggling with the disorder. Don’t forget that you can now subscribe to our blog and receive email notifications when new posts are released! See the left sidebar to add your email address to our list. We hope you take advantage of this new feature and find it helpful in staying up-to-date on our blog’s activity.